As everyone knows: Analysts are useless! Everyone knows that Analysts are technical writers and they just don’t think. They only write what the customer wants and say “Yes” to everything, even when it doesn’t make sense or it’s not possible to implement. They only write what the technical team thinks and defines. As everyone knows, Analysts are only Analysts because they are bad Developers or related to someone very important in the organization, like a father, cousin or a friend. 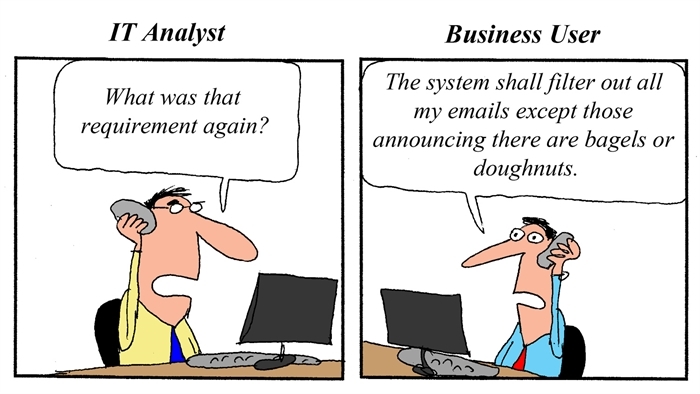 And what if Analysts are testers too? Could it be worse?! They just mess up. They don’t know what the system does and they try to make strange things. Sometimes they think there are bugs in the system but, as everyone knows, bugs don’t exist, just features… and probably the feature just exists because the requirements don’t compile. When they find a feature (as they are like demons! ), Analysts report it with less than ten words so Developers can reopen the issue at least five times, since they cannot understand the problem or the problem doesn’t happen in their machines. As everyone knows Analysts and testers don’t know anything about databases, integrated systems or architecture because it’s “too technical”. And everyone knows that never ever, in any case, they should have access to databases, consult the source code or even debug! Learn about the customers business, analyze the current state/environment to discover the reason why a change is needed (what he really needs and not what he thinks he needs). Understand what could bring value to the business and define the way to meet that business need. Work with the technical team to build business cases with possible solutions. Support the definition of a possible architecture for the system. Elicitate requirements with the right stakeholders and confirm them before implementation. Define and model requirements that are possible to be developed. Evaluate the impact and implications of the proposed requirements and design changes before asking the development team to implement them. Support the development team to specify the technical solution, helping them to organize the documentation. Specify a solution with the right level of detail, so both the development team and the customer can understand the solution. Specify a solution in which each feature makes sense individually and integrated with the system overall. Be able to follow and to give support to the development team. Define the right tests to quickly find the defects that most influence the delivery value. Report issues with sufficient detail to reproduce the problem, consult the database, system logs, source code or even debug, helping the development team to understand the problem. If organizations had someone with this profile in each project they could deliver more value to the customer with less development effort – are they aware of this? Well, Polarising recognizes that competent Analysts and testers are essential for projects to succeed. We make sure that the project delivers the maximum value t the same time we help customers to reduce their development costs. At Polarising it is possible to build and develop these competencies in-house because we acknowledge their relevance to our customers. So, everyone here knows… Analysts really can make difference! I work with analysts everyday, I believe analysts are a critical factor for a successful project.